Color Balance Purple neutralize brassy/yellow tones in blonde/gray hair. Platinum blondes and silver foxes, rejoice, your hair color regimen just went from high-maintenance to #instacool! Staying true to hue is now easier than ever JOICO's® glacial, yellow-mellowing duo is specially formulated to keep brassiness from deminishing blonde and gray hair's cool factor. With a perfect dose of tone-correcting purple pigments and color-protecting Multi-Specturm Defense Complex™, Color Balance Purple instantly neutralizes unwanted brassy and yellow tones. Massage into wet hair and allow the shampoo to absorb for three-to-five minutes, then rinse. Repeat the process two or three times per week, alternating with your regular shampoo. Water/Aqua/Eau, Sodium Laureth Sulfate, Cocamidopropyl Betaine, Cocamide Mea, Ammonium Laureth Sulfate, Glycol Stearate, Pentapeptide-30 Cysteinamide, Pentapeptide-29 Cysteinamide, Tetrapeptide-29 Argininamide, Tetrapeptide-28 Argininamide, Camellia Sinensis Leaf Extract, Hydrolyzed Keratin, Cocodimonium Hydroxypropyl Hydrolyzed Keratin, Panthenol, Amodimethicone, PEG-7 Glyceryl Cocoate, Disodium EDTA, Citric Acid, Guar Hydroxypropyltrimonium Chloride, C11-15 Pareth-7, Magnesium Nitrate, Laureth-9, Glycerin, Trideceth-12, Ethylhexyl Methoxycinnamate, Ethylhexyl Salicylate, Polyamide-2, Butylene Glycol, Methylchloroisothiazolinone, Magnesium Chloride, Methylisothiazolinone, Dmdm Hydantoin, Sodium Hydroxide, Sodium Chloride, Limonene, Linalool, Amyl Cinnamal, Fragrance/Parfum, Ext. Violet 2 (CI 60730), Red 33 (CI 17200). "L love this product .It keeps your hair color beautiful. Five star all the way"
"When you want to keep brassy hair at bay. Joico Color Balance Purple Shampoo and Conditioner are the way to do it. It keeps ashy blondes ashy." 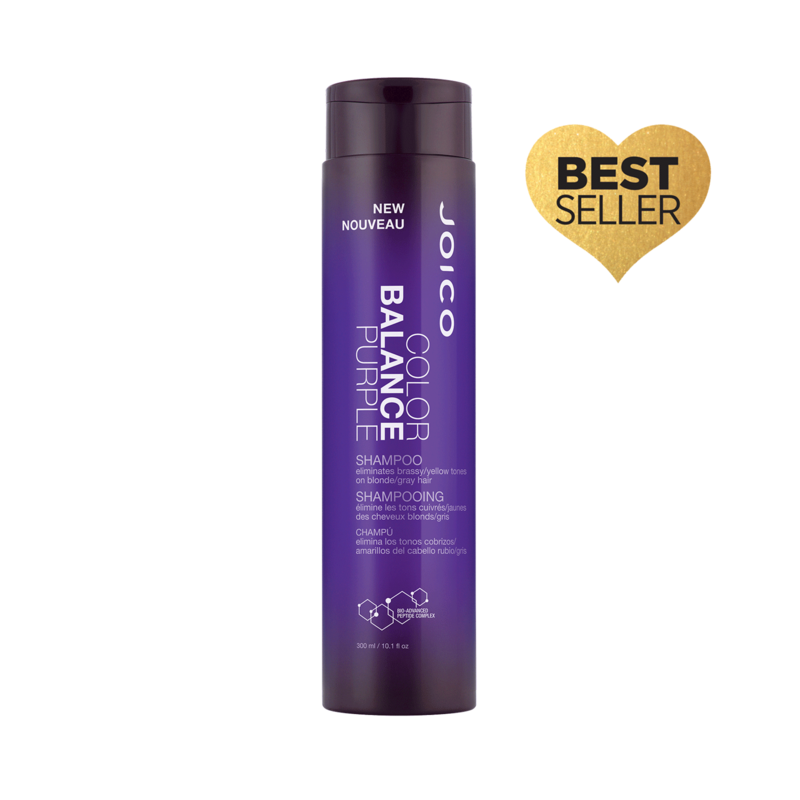 "Joico has created the perfect Color Balance Shampoo to help eliminate those unwanted yellow and brassy undertones. Great for in-salon use and for take home. This purple shampoo keeps clients' color vibrant in between appointments. Use according to directions for best results, and pair with the Joico Color Balance Purple Conditioner." "Great for blonde hair, takes the brassiness out!" Must have for Blonde hair! "I am a huge fan of Joico’s purple shampoo formulation! It’s got the perfect balance of pigment and moisture. There are some purple shampoos with stronger toning ability, but I find they lack in gently cleansing the hair. I recommend this shampoo to all of my blonde clients and use it at home on myself as well!" "This is a fabulous product. I keeps blonde hair bright and beautiful between colors without drying the hair."